Nutrition experts have found a cheap way to help save the environment and solve the food shortage crisis. They have found an abundant supply of food rich in calcium and protein, while low in fat. 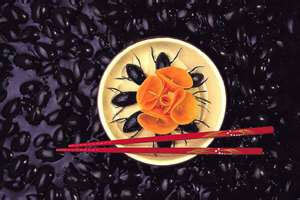 But the squeamish might want to look away now – because the food source is insects. The European Union thinks creepy crawlies should start appearing on menus after experts in Brussels recommended that bugs could be a vital source of nutrition, The Sunday Times newspaper reported. So scorpion soup and cricket casserole could soon be options, as the European Commission has now offered £2.65million into a project to promote eating insects. They have also ordered the UK Food Standards Agency to investigate and potentially look at ways to make entomophagy – the eating of insects – a more popular choice. One study found that grasshoppers offer 20 per cent protein with a tiny six per cent fat, compared to lean ground beef’s 24 per cent protein and 18 per cent fat. The research institute that offers the best proposal for investigating ‘insects as novel sources of proteins’ will be awarded the money by the commission. They will have to research quality and safety, potential allergies and what sort of proteins the insects offer. Professor Marcel Dicke, leading a team at Wageningen University, in Holland, is applying for the grant. He told the Sunday Times: ‘By 2020 you will be buying insects in supermarkets. Snacking on silkworm moth larvae or adding blitzed bees to sauces could offer a much-needed solution to soaring costs of red meat. More traditional sources of protein – such as beef – are not sufficient enough to feed the world’s rapidly growing population and are costly to feed, so their prices are soaring. Alternatively insects emit fewer greenhouse gases than cattle, require less feed and are viewed as more environmentally friendly. The Sunday Times reported that supporters claim that insects provide a minimum of 200kg of biomass – energy from biological material – because there is such a plentiful supply of them. After television series including I’m A Celebrity… Get Me Out Of Here! in which contestants have to eat unappetising meals of different insects in ‘bushtucker trials’ there has been a swell of interest in eating insects. Selfridges and Fortnum and Mason started stocking the insects to cater for the -as yet – niche taste.